In our Canopy theme, you can create a full-width dropdown menu with headings. We call it a mega menu. You don't need to touch any code, or even change any theme settings, to get a menu to show like this. It is all down to how your main menu is set up. The theme switches a dropdown menu into full-width mode when every link inside a dropdown also has a dropdown. 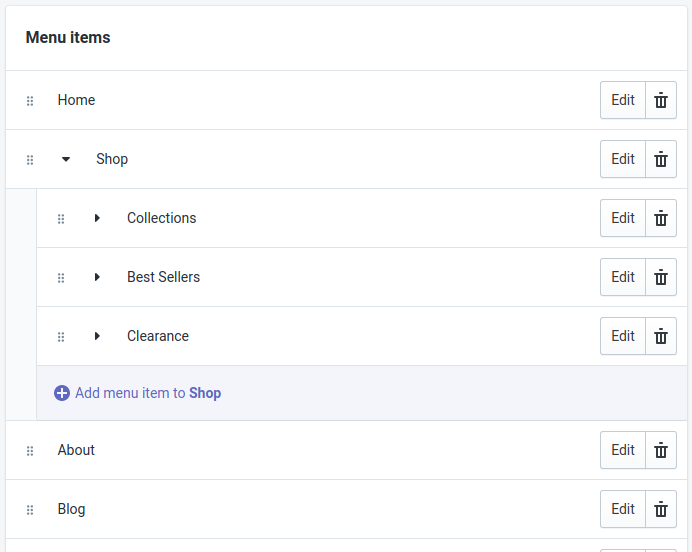 You can see here (by the little arrows) that "Shop" is a dropdown, and each link inside "Shop" is also a dropdown. "Collections" contains a list of links, as does "Best Sellers" and "Clearance". It's worth noting that if you don't want the titles (Collections, Best Sellers, Clearance) to link through to anywhere just use the link "#". A nice thing about this being down to how the menus are set up, and not to do with any theme settings, is that you can set up as many mega menus as you like!